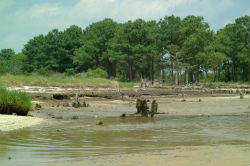 The Commonwealth of Virginia has extensive areas of shallow tidal water supporting essential habitats for estuarine flora and fauna along its thousands of miles of shoreline. Shallow water environments are vital to the coastal community, providing an enormous mix of ecological services. Managing coastal habitats for sustained ecosystem functioning, while accommodating increasing developmental pressures, has never been simple. The challenge is multiplied by the fact that the entire system is changing, driven by both human uses and climate change. Effective management requires some understanding of not only current conditions, but also potential future conditions. The state of scientific understanding does not yet support precise forecasting, but there is a sufficient array of information to begin assessing potentials for change in some key components of the system. The principal objective of this study was to develop a characterization of current shallow-water habitat components in Virginia tidal waters and predict climate driven changes to these habitats. To project broad-scale climate change effects on the abundance and distribution of coastal habitats, an inundation model based on anticipated relative sea-level rise, temperature and salinity projections, and coastal development were integrated into a GIS modeling framework. Using this framework, simple models were constructed that forecast the distribution of key coastal habitat parameters within the next 50 to 100 years including: shallow-water areas, tidal wetlands, submerged aquatic vegetation and estuarine beaches. The purpose is to inform management and planning efforts by identifying areas at significant risk for changes to habitat components, and areas with significant potential to support critical habitat components in the future. This will enable managers to make proactive decisions that can mitigate impacts and preserve opportunities for sustained habitat services as the estuarine system evolves. From a practical perspective, understanding potential futures can inform targeting of limited management resources to areas at greatest risk and/or areas with the greatest probability for successful outcomes. Appendix 1: Shallow-Water and Tidal Wetlands - Spatial depiction of existing tidal wetland (vegetated & non-vegetated) and shallow-water habitat, with projected shifts due to sea level rise. Appendix 2: Tidal Marsh Vulnerability - Spatial depiction of existing tidal marsh and vulnerability to inundation from projected sea level rise within 50-100 years. Individual Chesapeake Bay segments are illustrated with tidal marsh vulnerability classifications. Marshes classified at low risk represent potential wetland preservation opportunities. Appendix 3: Estuarine Beach Vulnerability - Spatial depiction of existing estuarine beach and vulnerability to inundation from projected sea level rise within 50-100 years. Individual Chesapeake Bay segments are illustrated with estuarine beach vulnerability classifications. Beaches classified at low risk represent potential habitat preservation opportunities. Appendix 4: Submerged Aquatic Vegetation - Spatial depiction of existing submerged aquatic vegetation (SAV) and projected shifts due to sea level rise and elevated temperatures. Appendix 5: Vulnerable Developed Lands - Spatial depiction of existing developed lands and vulnerability to inundation from projected sea level rise.